As promised earlier this year, Apple Pay on Tuesday expanded its international presence with activations in Denmark, Finland, Sweden and the United Arab Emirates, bringing the total number of countries supporting the service up to 20. The expansion was announced in a post to Apple's developer webpage, which notes app makers can now select Apple Pay as a secure payment option for in-app purchases and online transactions. Apple also posted Apple Pay assets to its regional websites, providing information about the service, as well as lists of supporting financial institutions and credit cards. All but one of the respective Apple Pay webpages appear to be generic translations of the existing U.S. version and have not yet been updated with appropriate credit card graphics or localized data. Apple Pay is supported by Nordea Group and St1 in both Sweden and Finland, while Nordea and Jyske Bank are offering initial integration in Denmark. Customers in the United Arab Emirates can provision both Visa and Mastercard cards issued by Emirates NBD, Mashreq Bank, HSBC, RAKBANK, Standard Chartered and Emirates Islamic. 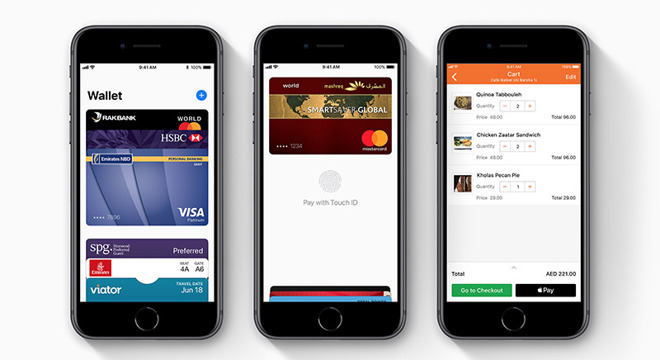 Apple's regional Apple Pay webpage for the UAE is fully localized, with credit and debit card graphics, references to popular online shopping site Ounass and a comprehensive list of participating retailers. Today's additions fulfill a promise made by CFO Luca Maestri in August during Apple's quarterly earnings conference call for the third fiscal quarter of 2017. At the time, Maestri said Apple Pay would launch in the four countries later this year, but failed to offer a specific timeline to launch. On Sunday, platform chief Jennifer Bailey reiterated those claims, saying she expected the service to debut in a matter of days. The Apple Pay expansion continues Apple's international rollout effort which began with a U.S. introduction in 2014. The in-house payments service has since seen release in Australia, Canada, China, France, Hong Kong, Ireland, Italy, Japan, New Zealand, Russia, Singapore, Spain, Switzerland, Taiwan and the U.K. Most recently, Apple Pay landed in Italy in May with support from two major banks and European prepaid service Boon. A month earlier, the service went live in Taiwan and Ireland. Apple has not revealed future plans for Apple Pay, but circumstantial evidence suggests Germany might be Apple Pay's next launch region. Further rumors point to upcoming support in Poland and the Netherlands, though no official announcement has been made regarding those countries. Earlier this month, SVP of Internet Software and Services Eddy Cue said Apple is working to bring Apple Pay to India, but failed to set a firm launch date.